Who screams for ice cream? Just about everyone! If you have a Carvel near you, tomorrow is your lucky day. This year represents the 80th anniversary of Carvel. 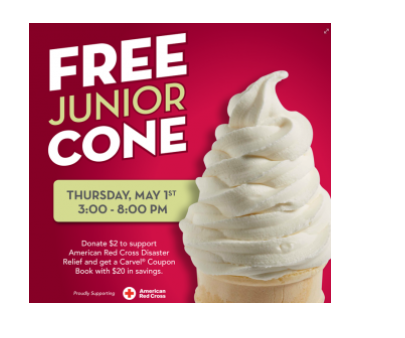 To celebrate, Carvel locations will offer guests free junior cones. The free cone offer is available on May 1 from 3-8 pm. Guests can choose from freshly made vanilla, chocolate or the all-new salted caramel soft-serve ice cream. While enjoying a free cone, consider supporting a worthy cause. Throughout the day, Carvel will offer a $2 coupon book worth more than $20 in savings. Carvel will donate 100% of all proceeds from coupon book to the American Red Cross® to support Disaster Relief with a maximum donation of $30,000. This effort will raise the company’s total contributions to the American Red Cross to $80,000. Don't forget to join Fudgie Fanatics! Guests that join between May 1 and July 20th will be entered for a chance to win free ice cream for a year. Also when you join Fudgie Fanatics you will receive a free treat on your birthday and the inside scoop on Carvel promotions. To find a Carvel near you, please visit the Carvel website.